Chantel was first introduced to YWCA New Britain through our STRIVE afterschool program for middle school girls. When she headed off to high school, she looked for something to do or a place to go after school. She didn’t find many options for teens in New Britain, so she decided to take matters into her own hands. Chantel was part of the Healthy Tomorrows program group of young women who developed the concept for YWCA’s teen center. With the support of staff, Chantel and her peers gathered week after week to complete a PhotoVoice project to present to the community about the importance of having a safe place to go after school. PhotoVoice is a photojournalism project that encourages youth to tell their own stories and advocate for change. The girls used digital cameras to take pictures of their neighborhoods highlighting unsafe areas and the lack of positive, productive things for teenagers to do in the city. With these pictures, they created photo boards and put together a script to present to various stakeholders involved in the development of the teen center. The girls' hard work and determination paid off. They got the support they needed, and the teen center was born. They were able to name the center- the House of Teens- and even had the opportunity to design their space. It will be a place for recreation and healthy after-school activities for teens for years to come. 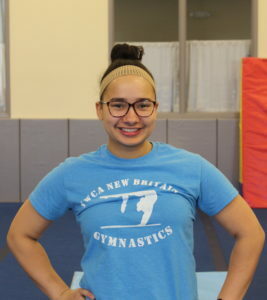 As Chantel moved through high school, she stayed involved with the YWCA volunteering at events and in the dance department, and even became one of our gymnastics instructors, teaching gymnastics and children’s fitness classes. She was able to foster her advocacy skills, build leadership abilities, and make a difference in her community. Somewhere in the midst of it all, she transformed from a quiet middle school student to a confident and capable young woman with the foundation she needs to be an independent, compassionate, and successful adult. Chantel recently graduated from New Britain High School and is currently a student at the University of Hartford. She is majoring in accounting, and plans to become an accountant one day. We have no doubt she will get it done.